We have already presented two other re-entries that can be used by the paddler after they have wet exited their kayak. 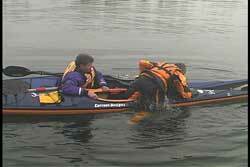 See USK articles, "Back Deck Re-entry" and "Between The Kayak Re-entry." The leg hook (knee hook) method of re-entry is a more recent development in recovery options. This re-entry technique is primarily used during assisted recoveries. I have not tried it with a paddle float yet, but I am sure there are some paddlers who may be able to do it during a solo paddle float recovery, especially if they secure their paddle under the back deck rigging. Since the paddler climbing back into the cockpit creates a good deal of force on the edge of their cockpit it will take a larger volume paddle float to keep the boat upright. I leave it up to you to see it it works for you during a solo paddle float recovery. The leg hook re-entry starts with your body vertical in the water with your chest facing your cockpit. The leg that will be used to hook the coaming is the leg that is closer to the bow when in starting position. I recommend the assisting paddler use the bow to stern stabilizing position, because the paddler in the water needs the area directly behind the cockpit unobstructed. As I mentioned above, the paddler climbing into the cockpit will be placing a good deal of force on the edge of the kayak, which will cause the kayak to roll over unless the assisting paddler stabilizes the kayak securely. The rotational force exerted in this recovery is much greater than the force typically experienced when the paddler climbs on to the back deck. The assisting paddler will be working harder when this re-entry method is being used. That is why I mentioned the amount of floatation from your paddle float being a factor with this re-entry method. 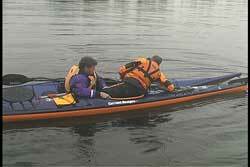 As an assisting paddler, be sure to practice stabilizing the kayak with your regular partners to see if you can provide enough stability to allow this re-entry method to work. As always, I recommend the assisting paddler not only hold the cockpit coaming as seen in the pictures, they should rest their upper body over the kayak they are trying to stabilize. 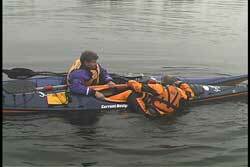 Adding your body weight makes it easier to stabilize the kayak. In order to get your leg into the cockpit you will need to lean your torso toward the water in the direction of the stern. Since kayaks have different deck rigging you will have to find adequate hand holds for your individual kayak. As you practice this re-entry method you will see why I regularly recommend reliable and functional deck lines. Your hand positions will change throughout the maneuver as you climb in to your cockpit. Here is a body movement tip you should store away in your brain, which is helpful when trying to move your body when you are in the water. If you lift your head, your feet will want to sink. If you want your feet near the surface try lowering your head. For this re-entry method you want your leg up into your cockpit. That means you should be lowering your head and upper body to make it easier to get the leg up. In this example Bill has moved his head and upper body down toward the right side in order to get his left leg up. If you haven't realized it yet, the higher the freeboard the more difficult it is going to be to get your leg up into the cockpit if you have shorter legs. See USK article, "Why Can't I Do That?" Before trying to lift yourself into your cockpit you need to have your leg in the correct position. Just putting your leg into your cockpit is not enough. The reason this re-entry method is called the leg hook of knee hook is because you are hooking your leg at the knee joint over the cockpit rim. It is imperative that you get the crease behind your knee over the edge of your coaming. If you do not do this, you will not have the leverage you need and you will find your leg slipping out of the cockpit. This is why I mentioned the concern of leg length and the distance your cockpit rim is off of the water. 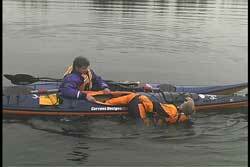 Once you have your leg hooked over the coaming you will need to reposition your hands across to the other side of your kayak. The farther you can reach the better leverage you will have from your arms. I don't want you to think that this is an arm pull-up re-entry. The arms are used for pulling, but they are mostly used for stabilizing your body. As you will see the greatest power will come from your legs. When you are ready to get into your cockpit, you will use your leg and thigh muscles to lift the bulk of your body out of the water. The best explanation I have heard so far regarding the leg movement is, think of pushing the hooked leg toward the foot brace. As you straighten the working leg the power of your thigh muscles lifts your lower torso out of the water. Your arms are holding your upper body from falling into the water. 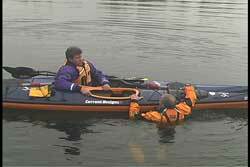 Think of the body action as sliding your pelvis area up onto your kayak. If you think of this action as pulling your upper body onto the back deck you will be muscling yourself up. The correct body movement is trying to lift your lower body up over the cockpit. As you lift the lower part of your body out of the water, by pressing your thigh into the coaming, your upper body will also come up on the back deck. As the paddler in the water lifts their body out of the water the assisting paddler will have the greatest work load during the re-entry. The goal of the assisting paddler is to keep the kayak from rotating toward the water so water does not flood into the cockpit. This is assuming that you have already emptied the water from the cockpit using any number of draining methods. If you intend to pump the water out, then extra water in the cockpit means extra pumping so it is still important you keep the cockpit above water level. When you have your body resting comfortably and securely over your back deck, you can then place your other leg into the cockpit. As you can see in the photo, Bill is lying on his back deck. If he had a lot of gear on the back deck it could add challenges or even prohibit his movements. The assisting paddler is still stabilizing the kayak with their body over the boat and their hands on either side of the cockpit coaming. When the paddler movers onto the back deck the shift in forces may cause the kayak to rotate toward the assisting paddler, if the paddler on the back deck leans to far toward the assisting kayaker's boat. The grip of the assisting paddler needs to be ready for movement in either direction. This is also a good time to mention the concern of having too many accessories on the front of your PFD. As you can see, the paddler climbing on the kayak is actually sliding up onto their kayak with the front of their PFD moving along the back deck of their kayak. What do you have on your PFD that can possibly snag on deck lines, deck rigging and/or gear stored on your back deck? See USK article, "Combat Ready Knife." This last part of the re-entry is the same as the back deck re-entry. Once both legs are in the cockpit when you are face down on the back deck, you begin to slide your legs and body down towards your foot braces. After your hips pass by your seat back you begin to rotate your body upright. I always tell me students to rotate up so you are looking at your support. In an assisted recovery your partner is your support. In a paddle float recovery your paddle float is your support. If you have a high seat back you will have to clear that seat back before you rotate upright. A high seat back can interfere with your body as you slide into your cockpit so you may have to lift your body over the seat as you slide down. 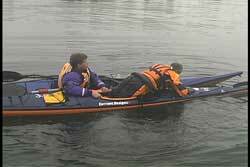 The assisting paddler will need to move their hands as needed to allow the re-entering paddler to rotate upright. When the paddler is back in their cockpit there is a good chance they will have their spray skirt wrapped around their body, because of previously rotating up in their cockpit. While I rest on my partner's kayak I can use one of my hands to help my partner straighten out their spray skirt. I use my inside hand to help with the skirt while my outside arm reaches over the kayak I am stabilizing. 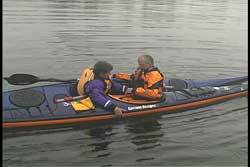 It is important to note that rotating forces of the kayak being stabilized reduce significantly when the paddler is sitting back in their kayak. When their backside is in their seat their center of gravity is lower, which makes it easier for the paddler stabilizing. When the spray skirt needs to be attached, the stabilizing paddler needs their hands off of the coaming. Just having the stabilizing paddler lying across the deck of the kayak and holding the sides of the kayak just above the water line usually provides enough stability for the re-entry paddler while they attach their skirt and get ready to continue paddling. If it were rough conditions the stabilizing paddler could also hold deck lines if more stability is needed. As always, the stabilizing paddler does not let go of the other kayak until the paddler in that kayak clearly states that they should let go. I must tell you that using the leg hook can cause bruising on the back of your leg and thighs depending on how much weight you are lifting out of the water and your body's propensity for bruising. If you are wearing shorts you can also get abrasions on your leg depending upon the roughness of the coaming. I suggest you have your legs covered by a wet suit or a dry suit if using this re-entry method. Since there is more force that needs to be counteracted by the stabilizing paddler, it is important to practice this with your different paddling partners to find out which ones can hold the kayak so your cockpit doesn't drop below the waterline when climbing in. This is of course based on the premise that you like this re-entry method. Upper body strength seems to be more of a factor with the back deck re-entry. I have had a number of women tell me they prefer the leg hook re-entry, because they can use their leg muscles to help them get back into their kayak. In addition, a woman's center of gravity it usually lower and it is easier for some women to have success with this re-entry as compared to the others. The only way you can find out if this re-entry will work for you is to try it. Even if you don't end up liking it there may come a time where you may need it. As I have said in many other articles, the more techniques you know the more options you may have when challenges arise. Pictures seen above were taken from a future USK Video "Capsize Recoveries & Rescue Procedures Update "